Oscillatory Thoughts: NeuroImage paper: "A method for event-related phase/amplitude coupling"
NeuroImage paper: "A method for event-related phase/amplitude coupling"
For those of you who haven't noticed, the title of this blog is "Oscillatory Thoughts" which really does refer to my research interests. The gist is this: neuronal activity oscillates and these waves play an important role in our cognition. 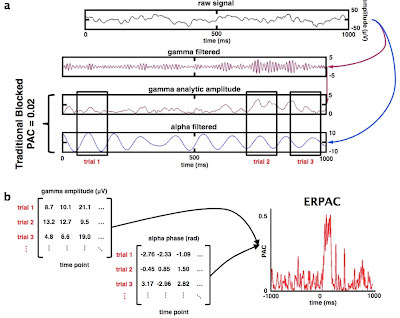 This latest paper of mine published in NeuroImage (accepted PDF version), "A method for event-related phase/amplitude coupling", is--as you can infer from the title--a method describing a different way of analyzing neural data than has been used before. This was a method I developed as I moved past the work from my (surprisingly highly-cited) Frontiers in Human Neuroscience paper and on toward the research that makes up part of my research I'll be presenting at SfN. In the figure above (Fig. 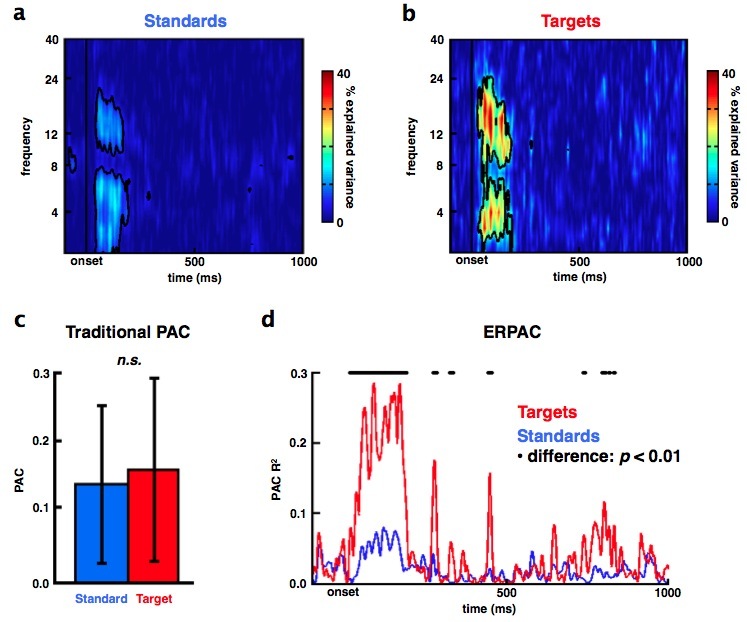 2 from the paper) I give a schematic of what phase/amplitude coupling (PAC) is, but essentially it means that the phase of the slow part of the neuronal oscillations gives you information about the strength of neuronal firing in that same general brain region. Normally this metric is calculated across some arbitrary length of time, meaning you can't get much information about when this coupling occurs. In this paper I simply took a standard regression-based approach to calculating this coupling and perform it across a series of time-locked trials. This provides a simple time-resolved measure of PAC. As always I have made the code used for this measure available on my website (zip file). A special thanks also goes out to Philipp Berens and his MATLAB CircStats toolbox. My work is isn't earth-shatteringly cool, but I believe it's useful. And it does seem to provide new information about the task-specificity of PAC. We don't know how different brain areas communicate to give rise to cognition. There's a complicated code that we don't understand. 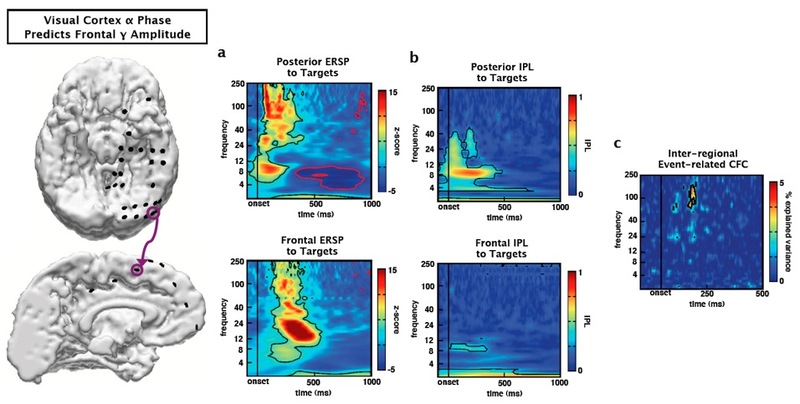 This nested oscillations idea might connect the really low-level physiology of the brain with high-level cognition that requires communication between a lot of brain regions. And it ties it all nicely together into a cool communication system where different low frequencies could act as "switches" to bias information flow between brain regions. 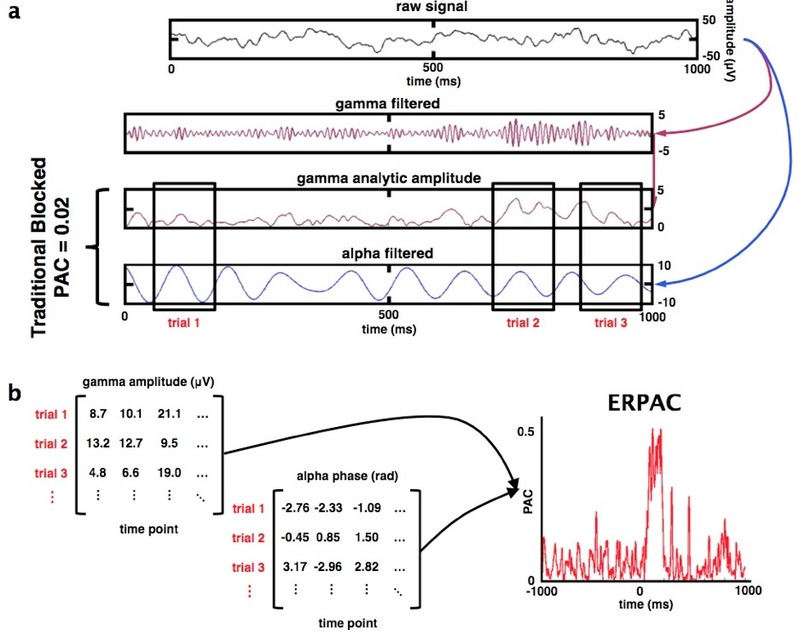 This method provides researchers with a new way of testing for transient changes in oscillatory communication. Unless you're really into methods, it's probably not worth reading, but I'm really proud of this one. This work was financially supported by the (sadly defunct) American Psychological Association Diversity Program in Neuroscience grant 5-T32-MH18882 (to B.V.) and the National Institute of Neurological Disorders and Stroke grants NS21135, NS21135-22S1, and PO40813 (to B.V. and R.T.K.) and NS40596 (to N.E.C.). I love this approach to releasing results. I think you've motivated me to start a blog for my research. Do it! I lean heavily toward the side of the fence that says that if we're going to take in hundreds of thousands of dollars of public money we can spend 30 minutes writing a few paragraphs trying to explain what we're doing with it. Richard: Ack! I just noticed this comment in the moderation queue, I'm sorry! Please email me if you have any questions, as I'm happy to talk, share code/experiences, etc.